Fort Defense is rated 3.8 out of 5 by 20. 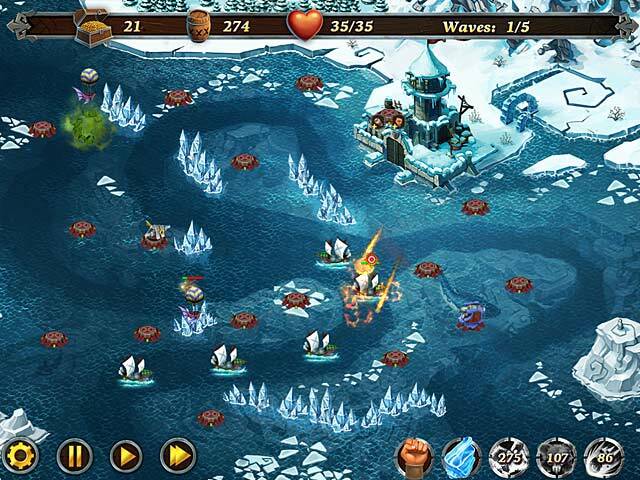 Rated 5 out of 5 by DrDavid from Another Very Good Tower Defense Game Another 8th Floor game like the Royal Defense series, but this one is on water. This plays like the first Royal Defense but with more tower positions. The enemies seem more varied in this game and they seem to be quicker too. Still winning is possible. I think I could have won every level but for a strange quirk where the upper left portion of the screen causes you to lose one life if you kill an enemy in that sector. An obvious flaw in the coding, it prevented me from a perfect score in several levels. Otherwise a very good game. Rated 5 out of 5 by Seji from Loved it! Some games are just plain ole fun and this one is no exception. Defend your castle by upgrading your towers and shooting down the bad guys before they get to you. Lots of fun, action, great graphics and sound. The level of challenge is adjustable. Try it! Rated 5 out of 5 by madgicsh from LOVED IT! I have all the defense games and can't wait for another. Just wish I could get that third star on level 40 though. Rated 5 out of 5 by pennmom36 from PROTECT YE CASTLE! What a fun game! 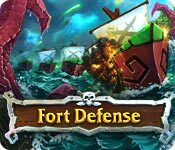 The first thing you will need to do is determine where to place the crossbows, cannons and various other weapons to defend your castle from the enemy fleet. The entrance is marked with an arrow and the ships will follow the path (in dark blue) and as they intertwine around your weapons they will shoot and as they hit the enemy ship you gain points and the ship looses power until they sink. As you earn more points you will use these points to upgrade the range of fire. You can also choose to build mines that will produce gold desperately needed to buy and upgrade your defense. Spells such as meteoroid showers can be accessed to reign fire balls over the enemy. You will be given the chance to shop with your earned powder kegs after each 5 round battle to increase range of weapons, strength of power or even to reduce cost of the weapons. Go ahead and try this game whether male or female you will become addicted to this game quickly and anticipate your next wave of battle, enjoy! Rated 5 out of 5 by mammamia21099 from Ahoy there Matey's! 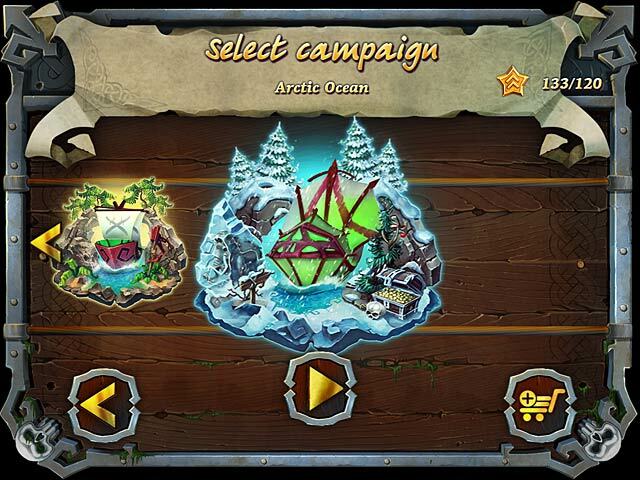 A Great New Pirate Tower Game Awaits! Loved it! 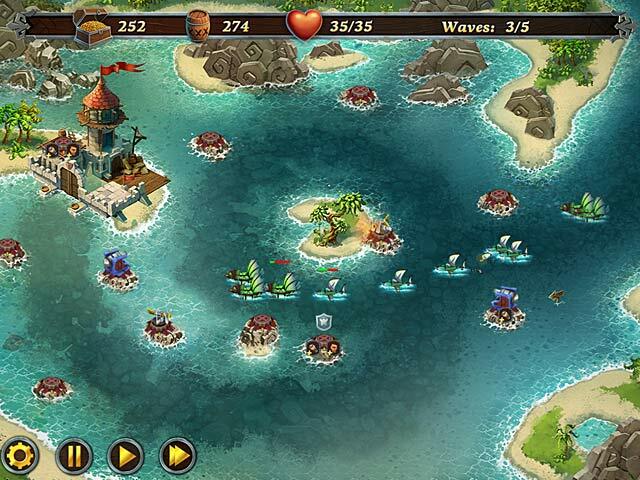 This is an addictive pirate style tower game. It has 3 modes, Easy, Intermediate and Hard. I had my card out to purchase as soon as the trial was over. I am not normally a big fan of tower games, but a few of them are among my favorites and this one now heads the list. Although there are not a lot of instructions, the ones they give are clear and concise. I thought it was a great game and can't wait to get back to it as soon as I finish this review! Hope you enjoy it too! Rated 4 out of 5 by mouser9169 from Sometimes you just wanna blow stuff up That's what this game is for. I haven't played tower defense in a while, got hooked for a bit before CWA shut down, so it's been a while. This is just a good, simple fun game. Buy your units, upgrade them, if you lose, go back and upgrade some more. Think quick, plan a bit, and wreak some carnage! Rated 4 out of 5 by SockTrollQueen from Easy to play hard to master, tactics are key. Wonderful yet simple artwork with beautiful detail. Great upgrades for towers and spells. Audio and visuals were excellent. Definitely not for beginners. Play the demo to see if you are skilled enough to buy it. It's on my to buy list.